"I thought it was a bit too far out and I took another touch and then just smashed it. 31/03/09: Macca - "We kept plugging away and I thought we deservedly equalised." A late strike from Calum Woods saves Pars from an eighth league defeat of the season at East End Park. Dunfermline have failed to score in the last six games against Dundee and the Pars have not recorded a home win over their opponents since the end of the 2004-05 season. Details of a tribute to Dunfermline music idol Stuart Adamson at East End Park. Dunfermline supporters are seeking support for a Holyrood petition calling on football authorities to revisit rules for SPL grounds. Semi Final Ticket discussions, Former Players Club progress. "When I caught it, I caught it sweet and it was fortunate to go in the top corner. "It's been two good wins then not played well, one good win, then a draw played rubbish, got beat, got beat. It is not good enough for Dunfermline Athletic Football Club." 24/03/09: "We just never did enough, we were second best tonight. Everyone at East End Park hopes that the Homecoming Scottish Cup Quarter Final win at Aberdeen, followed by the demolition of Clyde on Saturday will be the start of a run of successful results. Schivone and Cannon gave Pars 2-0 half time lead. A Jordan White double made it 4-0 and Cannon added another to made it 5. "After the high of going through to the semi final and then coming here and scoring a few goals as we put on a good performance it has been a good few days. "I enjoyed the game; that is the first time that I have scored more than one in a game so I am delighted with that." 22/03/09: "We scored at the right time and after that we just bossed the game with some real good stuff. 20/03/09: "We need the points but we know that we will be in for a tough game; you never ever get it easy against Clyde. ..
"I knew where I was hitting it and knew if it hit the back of the net we were in the next round. 18/03/09: "It is obviously great to come up to Aberdeen and turn them over and now we can look forward to the semi final. ..
Nick Phinn and Calum Woods content with putting pen to paper reveal the thinking behind their decisions. Pars win on penalties after Paul Gallacher saved from Severin and Foster. Hampden here we come. "We have watched the DVD of the first game and analysed where we lost the goal. This time we just want to go up there and enjoy the experience against the bigger team. Fans could be forgiven for thinking that, for all the Pars played well, their best chance of making it to the semi final of this year's Scottish Cup might have gone. "I have just shown the ref our offside 'goal' on the video and it is a mile onside and it is a big, big mistake. We are talking at least two yards onside; it is not in line with the player. Dunfermline Athletic are delighted to announce extensions to the contracts of two of their rising stars. The Pars came out winners last time with Rory Loy netting from the spot after Steven Bell had been scythed down in front of goal. "I wanted to prove myself to the fans and I was glad to get a goal but disappointed to lose ..
1-0 down midway through first half. Bell 1-1 in 56. After 66 Davidson made it 2-1 Livi, Graham equaliser within the minute and Davidson scored again two minutes later. Griffiths made it 4-2 in 76. After two first team, one reserve team and one U19 team match postponed in Dingwall, White scores but it was a defeat. Calum glad to be back but now sits out two match ban. "You get a bit more time on the ball that lets you play. In the First Division there is maybe not as much football played, I think it suited us to play a bit ..
"It was always going to be a tough one, we know that they are a good side but we should have had enough in our locker to keep them out. They put up a good fight and had decent chances themselves. 07/03/09: JM - "That's three times we have met Premierleague opposition this season and I think we have given a good account of ourselves each time. Homecoming Scottish Cup Quarter Final. Sone Aluko hit Aberdeen ahead in 61 but Nick Phinn scrambled an equaliser with eight minutes left. "If you cannot get up for a game like the one on Saturday you would have a problem. There is a good tradition at this club and it's one we want to keep going." 05/03/09: They did a marvellous job here and should be applauded for the work they did here. Hundreds of mourners turned out at Cleish Parish Church on Tuesday for the funeral of Mary Leishman and to remember all that Mary was for Jim, son Jamie, daughter Kate and husband Gordon. The return of the two Jimmies - Calderwood and Nicholl - to East End Park with their Aberdeen team adds extra spice to Saturday's Homecoming Scottish Cup Quarter Final tie. 02/03/09: Andy Kirk ruled out but the Manager is hoping his side can bounce back even without their top goalscorer. Tuesday night's First Division match against Ross County will be the Pars first visit to the most Northerly League Club in the country. 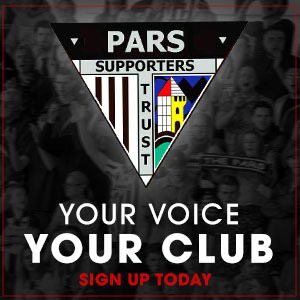 Iron side too tough for Pars. "They are a big team and they play to their strengths. Young keeper returns to action after 11 months out.